The use of LiDAR is a proven technique to map and identify the relative distance between powerline conductors and trees. This delivers an objective, scientific assessment of proximity (to avoid a flashover) and also if a tree has the potential to fall-in to the line. Typically, however, on lower voltage distribution networks, the method can identify thousands or even millions of trees with the potential to impact the line. Our Vegetation Analytics service helps to narrow the focus considerably - identifying which of those trees are more likely to fall, based on our modeling of local environmental patterns. We can also extend this to look at the consequence - further refining the list of trees for visual assessment. Why do networks use remote sensing techniques to identify tree fall risk? Remote sensing techniques like LiDAR rapidly capture network data and turn this into actionable information. They are a proven method to understand risk, compliance and ensure that grow-in and fall-in trees can be effectively managed. Network resilience is key, as outages negatively affect service levels and reputation. Potentially leading to lower revenues or financial penalties not to mention the safety risk to public and property. Using LiDAR is now commonplace on many networks around the world. Transmission utilities have been using this practice for a number of years and distribution utilities are now increasingly adopting this methodology to understand their vegetation status. The typical approach is to use the minimum distance between the top of a tree and the nearest conductor on a circuit. Using geospatial analysis to assess the geometry, it is possible to quickly establish if a tree could strike the wire. In a transmission situation, this would warrant tree removal in most cases. For distribution network operators however, this isn’t usually an option as tree removal can only be justified if there is a demonstrated risk, given that the vast majority of trees will not fall. So, how to decide which trees should be assessed by a qualified inspector and then managed accordingly? The premise behind our Vegetation Analytics service is to better target the utility forester. Rather than trying to assess an unmanageable number of trees, better to focus efforts on those trees which are statistically at higher risk. This allows for a more thorough and targeted assessment, optimizing finite budgets and levels of resource. NM Group have developed a new set of analysis methods and reports as part of our vegetation services. This uses the knowledge and tools gained during two years of collaborative academic research with Durham University, alongside our considerable organization knowledge base. By analyzing historic tree falls, we can understand what factors and environmental conditions influence tree failure and make predictions about where the next problem is more likely to occur. Applying this to any given network, using newly captured data or that which is already in the bank, we can first identify all the potential fall-in trees. Next we build a robust, localized and tested predictive model across homogeneous parts of the network based on what we observe. Applying this to the current set of trees, we can then provide a strong indication as to how well each tree matches the historical pattern of fall - with the highest ranking indicating greater potential that it is a true hazard tree. Quantitative testing of the models on historical fall events indicated an 80% success rate in the model’s prediction. This provides confidence that the outputs on the current trees are reliable and can be used to carry out direct action or target utility staff in their final assessments of risk and management tactics. Our findings clearly demonstrate that tree failure is heavily dependent on local factors, even within a single utility network. 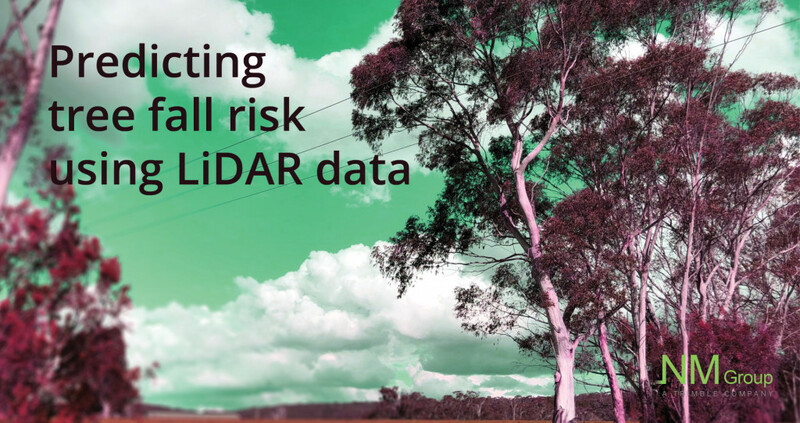 LiDAR data provides the basis to enable more comprehensive understanding. Our Vegetation Analytics build on this service further to better prioritize inspections based on an enhanced understanding of fall likelihood, consequence and therefore exposure to risk. Find out more about our Utility Vegetation Management service.